"This is a summer favorite that I served in many restaurants, inspired by my 'oops, the Cabernet wine has turned again in the heat,' moments. This is usually the meal, but it may also be an appetizer salad as well. I offered it as both in my restaurants. The dressing and pecans keep for a few weeks unrefrigerated, and I often make these in bulk in advance for several meals. A simple dish, easily made by any level cook, it is a stylish, beautiful, and delectable entree salad fit for company." Whisk together 1 tablespoon olive oil, brown mustard, garlic, 1 teaspoon salt, cracked pepper, and port wine in a bowl; pour marinade into a resealable plastic bag. Add the beef, coat with the marinade, squeeze out excess air, and seal the bag. Marinate in the refrigerator for at least 1 hour (up to 5 days if necessary). Bring Cabernet wine and dried cherries to a boil in a saucepan, reduce heat to medium, and cook, stirring occasionally, until wine has reduced to about 1/3 of its original volume, about 20 minutes. Dissolve 1 teaspoon sugar and 1/4 teaspoon salt into the wine mixture and pour in extra-virgin olive oil. Remove from heat and let dressing cool. Preheat oven to 350 degrees F (175 degrees C). Grease a sheet pan. Toss pecan pieces in a bowl with water, 1 tablespoon sugar, and 1/4 teaspoon salt in a bowl until thoroughly coated. Spread coated pecans into the prepared sheet pan. Bake pecans in the preheated oven until the coating adheres to the nuts and pecans are fragrant and brown, 15 to 20 minutes. Remove from pan and immediately transfer to a large heatproof plate to finish cooling. Be careful, candied pecans are extremely hot. Set pecans aside to cool. Preheat an outdoor grill for very high heat and lightly oil the grate. Remove steak pieces from marinade, shake off excess marinade, and grill until steaks are seared and done to your desired degree of rareness, 1 1/2 to 3 minutes per side. An instant-read meat thermometer inserted into the thickest part of a steak should read 145 degrees F (65 degrees C) for medium-well. Discard used marinade. Let steaks stand for 5 minutes after grilling before cutting into thin slices. To serve, mix baby greens with shaved carrot and radishes in a salad bowl and divide onto 4 large serving plates. 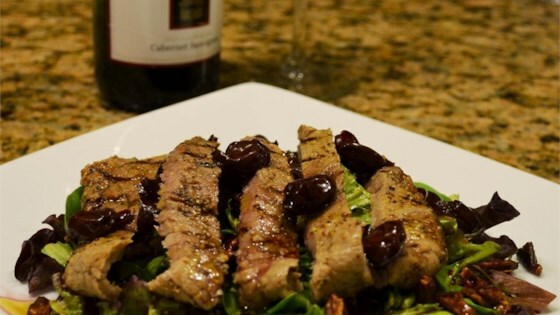 Lay slices of beef in a spoke pattern on top of greens and sprinkle each salad generously with candied pecans. Whisk dressing and drizzle over salads, distributing a few cherries onto each salad. Pecans and dressing can be made ahead of time. Store pecans in an airtight container to prevent them from getting stale. Simply awesome as is. Everyone loved it and I had no leftovers. We Loved this! Just Watch those pecans, l almost burned them. Next Time I'll take the temp down a notch. Great Way to use up not so great cab. Delicious!